Harry Houdini spent a good part of his life exposing mediums and 'unexplainable' phenomena. 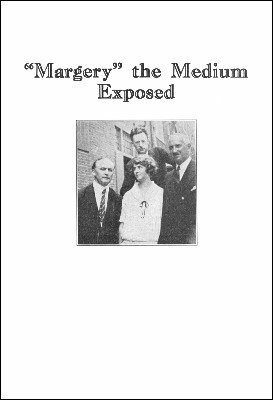 In this booklet he describes the case of the Boston "Margery" and the prize the Scientific American put up for true paranormal effects. He not only clearly describes and demonstrates the tricks of this very clever medium but also tells the difficulties surrounding the actual exposure. Houdini was world class in the role of the detective. It is fascinating to read how he sensitised his leg to be able to feel the slightest movement the medium made. Margery or Mina Stinson (1888–1941) was born in Canada and moved to Boston when she was fairly young. After an unsuccessful marriage, she became the wife of a senior Boston surgeon, Dr. Le Roi Goddard Crandon in 1918. They bought the house at Number 11 Lime Street on Beacon Hill, and became popular in Boston society. Dr. Crandon was a highly respected instructor at Harvard Medical School, and Mina was known as a very attractive lady with a sharp and lively wit. In the early 1920s Dr. Crandon became interested in parapsychology and they began to experiment with table-tipping and spirit raps. During these experiments Mina turned out to be a very strong medium. And so it all started. 1st edition 1924; 40 pages.